Double Funk Crunch is a party band serving clients who desire fun and entertaining dance music for their corporate, private and public events. Unlike many other musical groups, Double Funk Crunch employs costume changes, theatrics and a wide variety of dance music in an interactive show designed to appeal to a multitude of people. 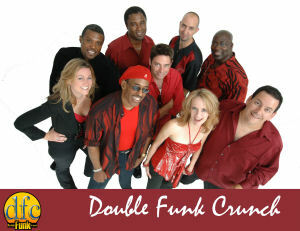 Double Funk Crunch originally established themselves as a 70's disco band. Now they have expanded their repertoire to encompass all types of dance music from the 70's, 80's, 90's, and todays top hits!